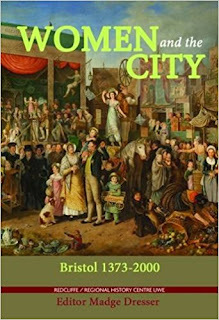 Women and the City: Bristol 1373-2000 is a collection of essays by respected academics. It’s a lively, absorbing read. A good balance has been struck between well-written prose and contemporary illustrations. The book and its content is presented in a way that invites even a casual reader to keep turning the pages. There’s a handy list of abbreviations right at the front, which is much easier than having to flick through to the index, or notes, each time a set of initials pops up in the text. Other academic works would do well to follow this example. I bought Women and the City: Bristol 1373-2000 to help with research for my own book, Struggle and Suffrage: Women’s Lives in Bristol 1850-1950, but after studying the sections relevant to my own work I went straight back to the beginning of the book and read it all. It’s a mine of information for anyone with an enquiring mind. I’d particularly recommend it to aspiring historical novelists in search of inspiration. The fact that a woman (Ann Barry) held the lease of that stronghold of “Enlightened” masculinity, the Exchange Coffee House in Corn Street offers all sorts of dramatic possibilities, for example. It’s often forgotten that Bristol women struck a significant blow in the fight against slavery. The formation of the Bristol and Clifton Ladies’ Anti-Slavery Society is never as widely reported as Bristol’s part in that terrible trade. This book helps to put that right. Women and the City: Bristol 1373-2000 is curated by Associate Professor of History at the University of the West of England and Fellow of the Royal Historical Society, Dr Madge Dresser. The breadth of its content and unique style of each contributor makes for a fascinating read. It offers great insight into the history of Bristol and its people. Anyone who knows the city will look at local landmarks with new eyes after reading it. To sum up, this is an invaluable collection for historians, and anyone interested in women’s studies. It’s also an inspiring read for the rest of us.